The move to Chandler, OK was on September 29, 2016. We took all back roads from Oswego to avoid the tollway, costly for an RV with a tow dolly. It is always an interesting drive when we do this. Oak Glen RV Park was home for the week. 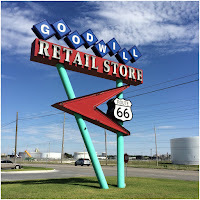 It is located right on Route 66, can't get any closer than that. It is a combination RV Park and Mobile Home Park. The RV park is well maintained, the mobile home park not so much. There are some permanent campsites but those are kept up very well. Most sites are fairly narrow but we lucked out and got the end site which has a great grassy area next to it. We paid $17 a night with our Good Sam Discount. Even though it is on Hwy 66 the road noise was minimal. There was lots of open space to walk the dog. There was only one down side to our stay, on Sunday around 5:00 pm the police showed up to a trailer across the park from us. We assumed maybe a break in or something, until they started roping off the entire site with caution tape. The guy who lived there was found dead by his fire ring, and unfortunately it was a young boy who found him. The investigation lasted until 3 am or later. They brought in large spot lights to be able to continue after dark. As of this posting they seem to think there was no foul play involved. First major incident since we have been on the road. 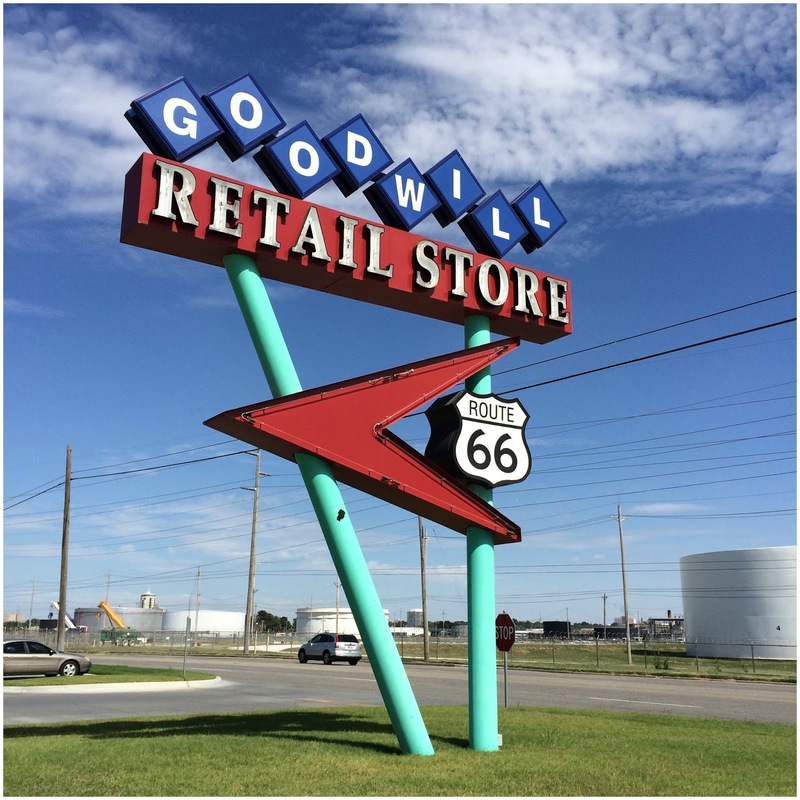 Route 66 was the plan for this trip. 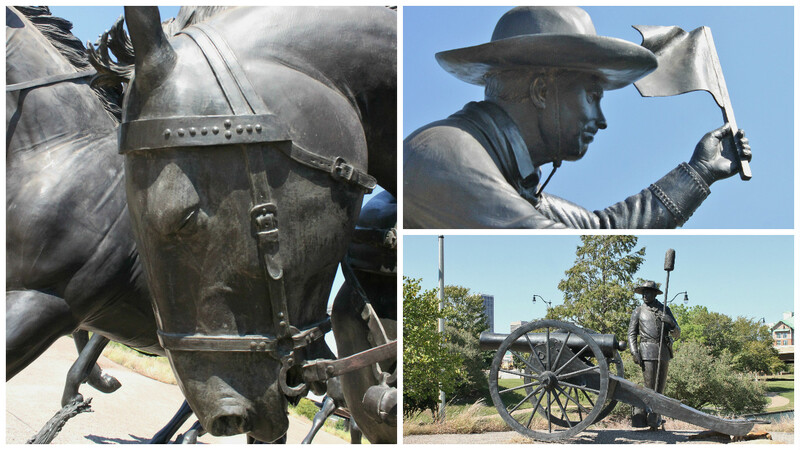 We headed to Tulsa where we left off last time and explored to Oklahoma City. There was not as much on this stretch as we have seen in other places. 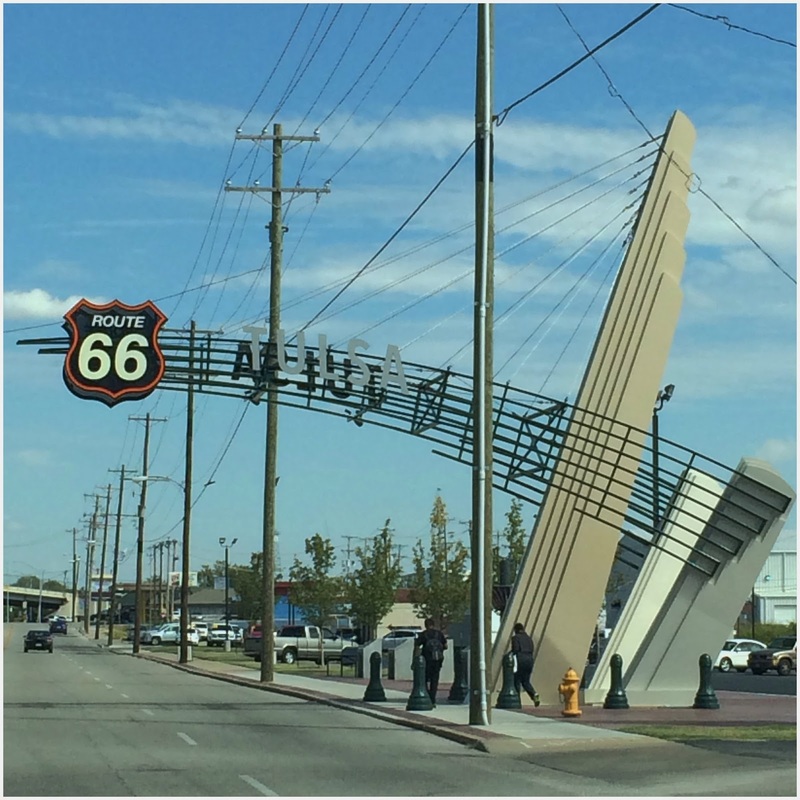 As you enter Tulsa from either end of the city, there is a large Route 66 sign over the road. Route 66 Village is home to a restored Frisco 4500 steam engine that carried passengers from St. Louis through Tulsa to Oklahoma City, from 1940 -1947. 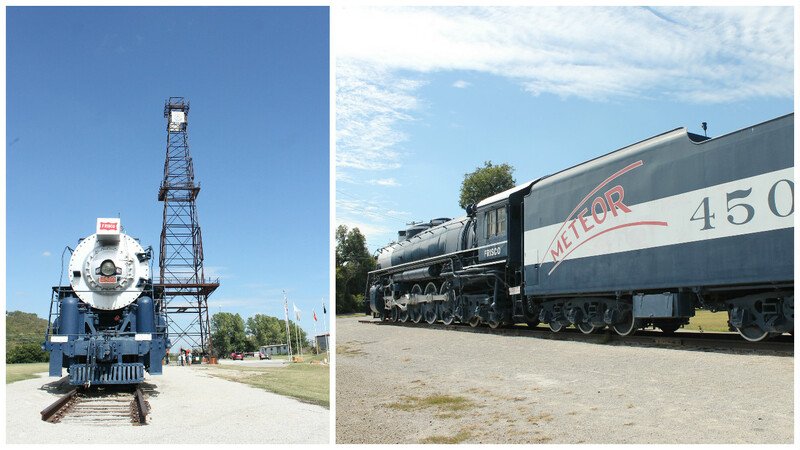 There is also a 154-foot tall oil derrick, the largest in North America. 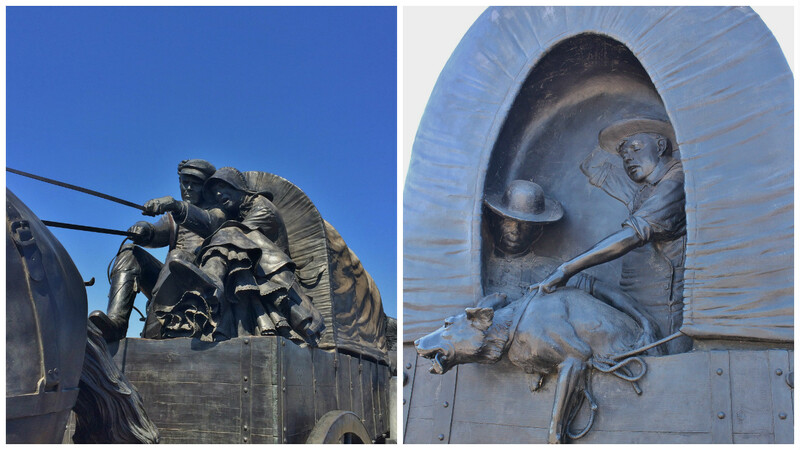 The Cyrus Avery Plaza has a large sculpture depicting the old meeting the new. 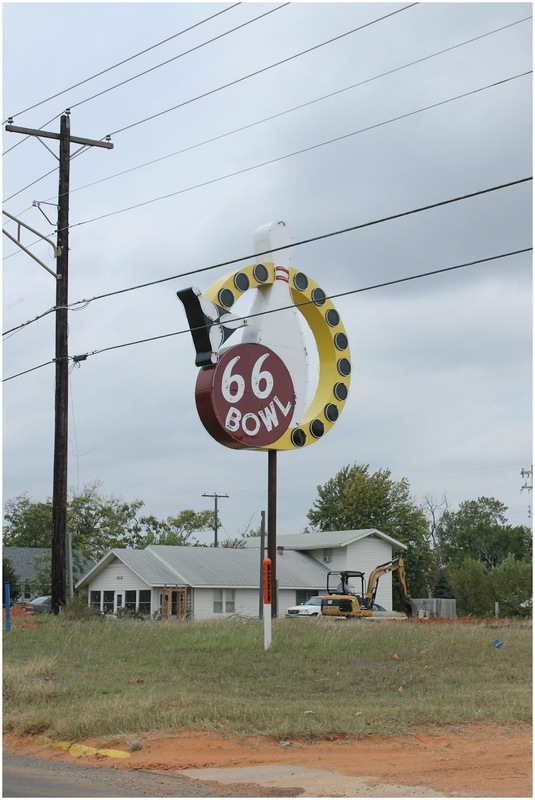 Cyrus Avery was a leading figure in getting Route 66 to come through Oklahoma. Old signs are one of the best things on the route. Even the Goodwill Store has a cool one. The old buildings, especially the gas stations are always fun, they did create some great buildings back in the day. 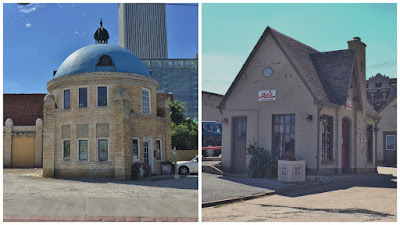 The Blue Dome Building was a 1924 Gulf Oil Gas Station and is now an office. What is now an Avis Car Rental was once the Vickery Phillips Station built in 1932. 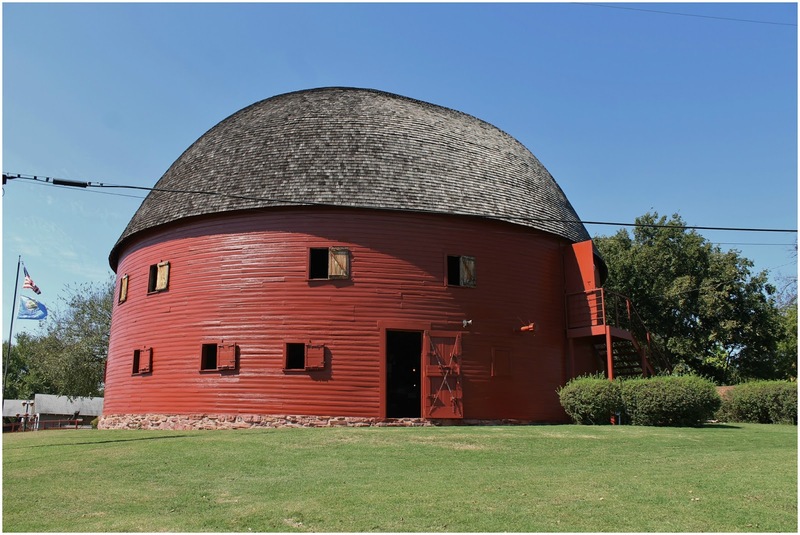 These cottage style buildings were so popular that by 1930 there were 6,750 of them in 12 states. 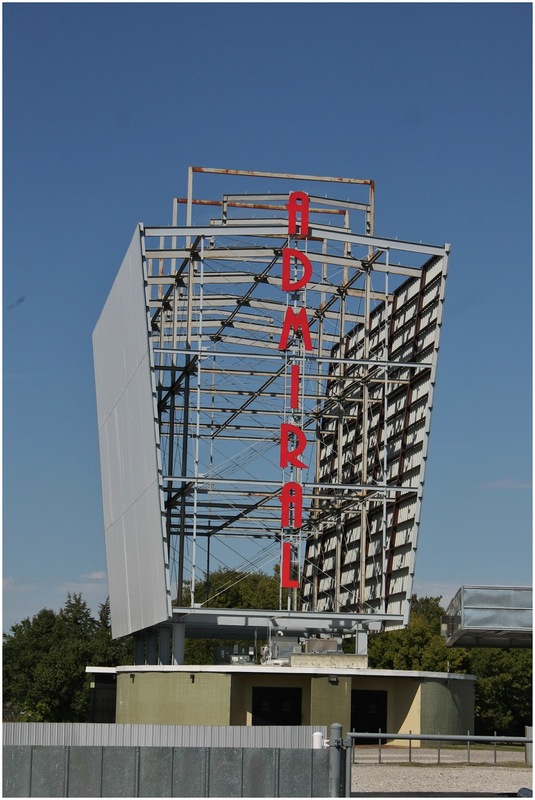 The Admiral Drive-In was built in 1951 and is still in operation. 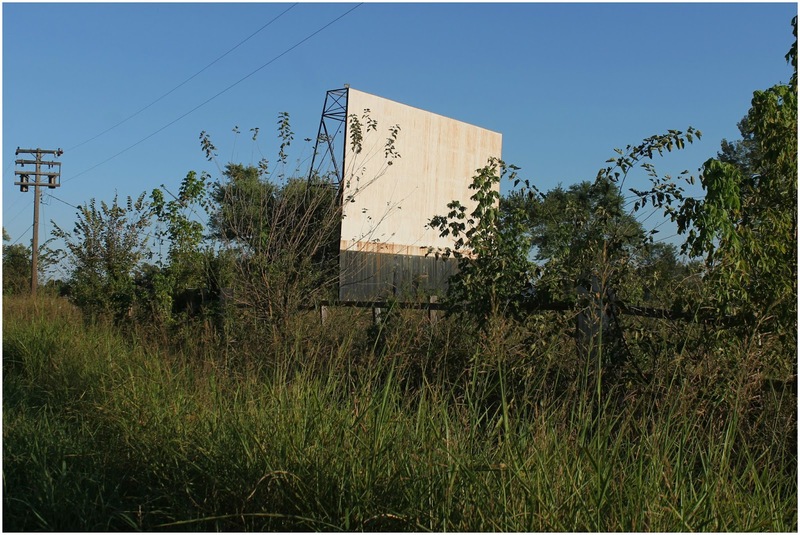 It is Oklahoma's largest drive-in, with a capacity of more than 1,000 cars. 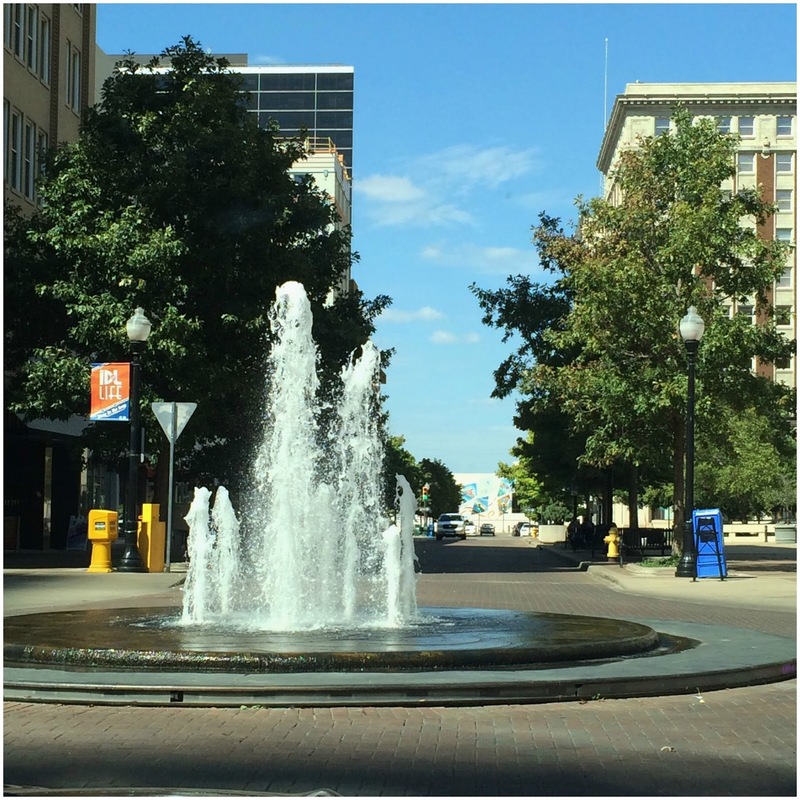 We have seen some really neat round-abouts in our travels, like this fountain one in downtown Tulsa. 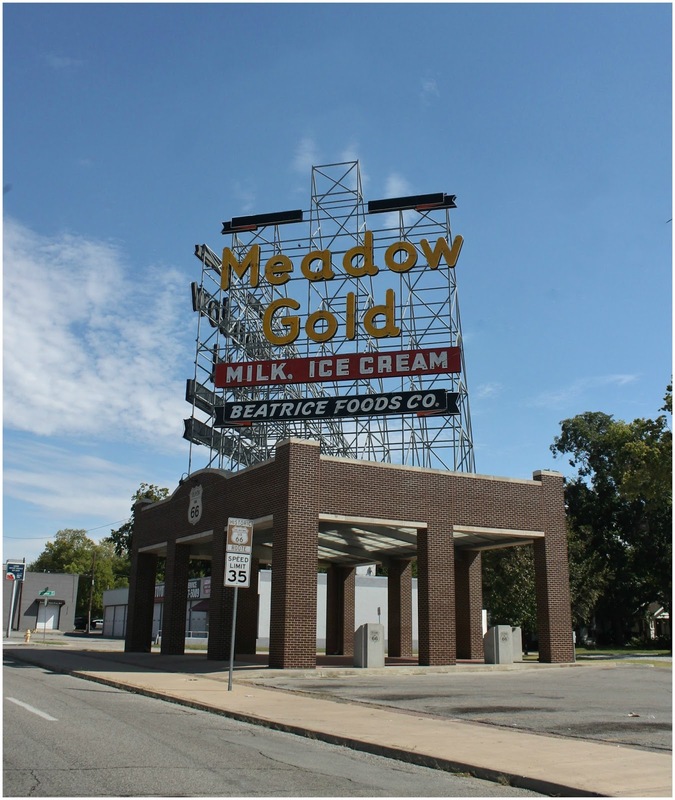 Next town was Sapulpa. 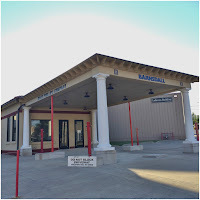 The Waite Phillips Filling Station is here, it was built in 1923 and is now a historical museum. It is thought to be one of the first with such a large covered pump area. 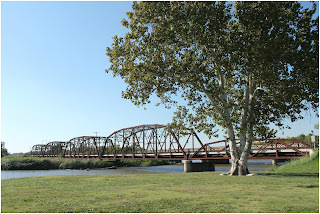 You come to the Rock Creek Bridge just as you are leaving Sapulpa. It is on the 1920's portion of the route. Today a number of vehicles would not be able to cross it as the clearance is only 7-feet. 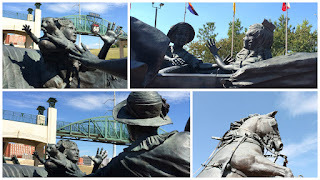 A railroad track runs right next to it, which gave Nancy an opportunity for another reflections photo. 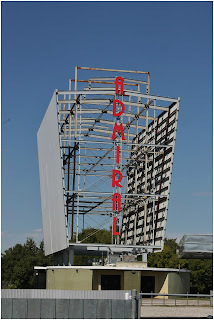 Just down the road from the bridge is a drive-in that didn't make it. 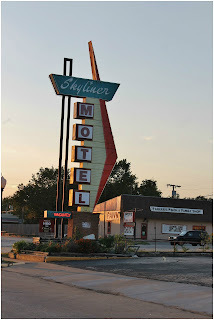 In Stroud there is a great sign for the Skyliner Motel. Dawn Welch the owner of the Rock Cafe, was the inspiration for the character Sally Carrera in the film "Cars". 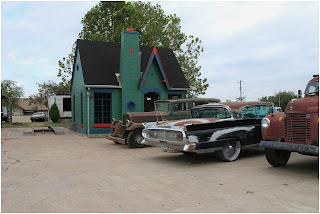 The restaurant was built in the 1930's and is the only remaining business from that time period. 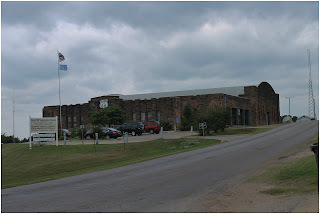 Over the years it has been run mostly by woman, in the 40's during the war it doubled as a Greyhound Bus Station. It was damaged by a tornado in 1999 and a fire in 2008 and funds from the National Park helped to restore it. Just a short distance from our campground as you head into downtown Chandler, you came across this cool bowling alley sign, no bowling alley just the sign. Right down from there is the Lincoln Motel. We loved the sign that there are direct dial phones and free local calls, something we don't even think about today. The Route 66 Interpretive Center is the best one we have been in so far. The building was built between 1935 and 1937. It was the Oklahoma National Guard building. 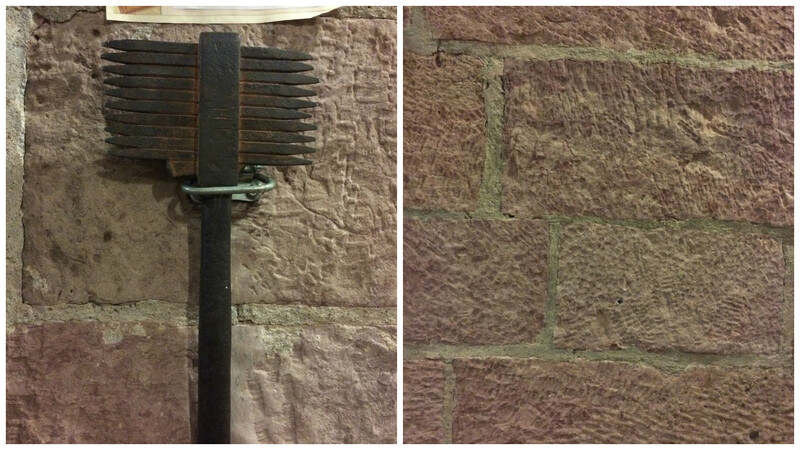 The sandstone walls were hand chiseled by over 250 workers. The outer walls are 20" thick, built to withstand tornado winds.They have one of the chisels they used on display and it is extremely heavy. The construction offered much needed employment during the Great Depression. The displays were very unique. One room is filled with memorabilia from the route and over 50 photographs, both current and old. 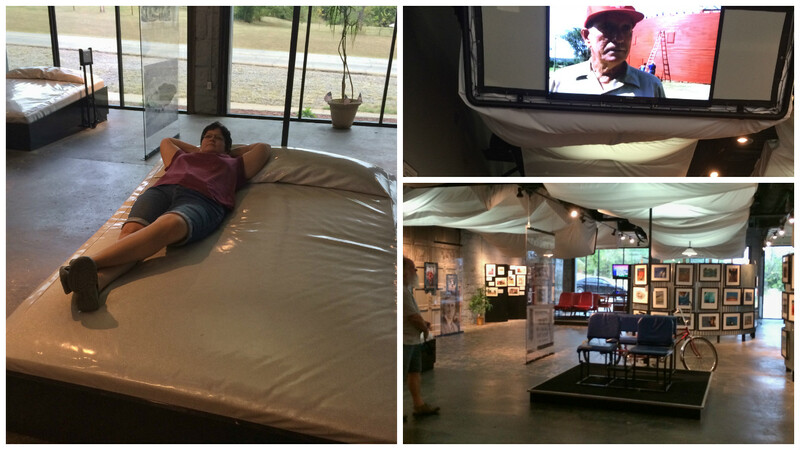 There are "beds" to honor the memory of the many motels that lined the route. 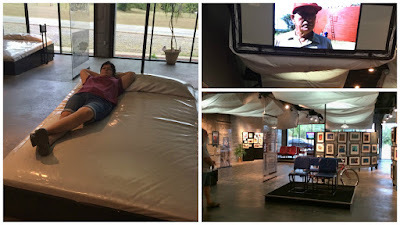 You can lay on them and watch videos about places on the route. There are also other video areas with seats from old cars and trains. The Phillips Gas Station now sits empty, but has been kept up for show. There are some cool old cars in the parking lot. Sure do miss the uniqueness of cars these days. Just outside of town we came to Wilson's Fruitstand and of course we had to stop. Enjoyed delicious fresh tomato sandwiches for dinner that night. 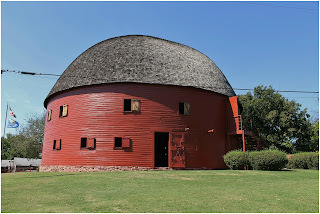 Warwick is where the Seaba Station Motorcycle Museum is located. It is in a restored 1921 gas station owned by John Seaba who employed 18 people in the late 1930's. They worked on Model-T's and ran an engine repair shop. 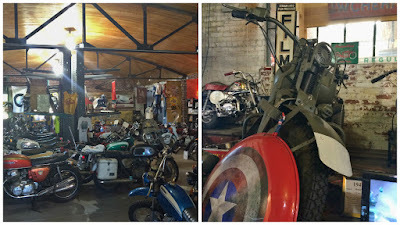 Today it holds about 65 vintage motorcycles from 1908 to current. One of the best was the motorcycle that was used in the Captain America movies. The township of Luther is a small farming community. The Booker T. Washington School for Blacks was built here in 1916 and was open until 1957 when the school system was integrated. During the Jim Crow era, black travelers where not always welcome at some of the motels and gas stations. 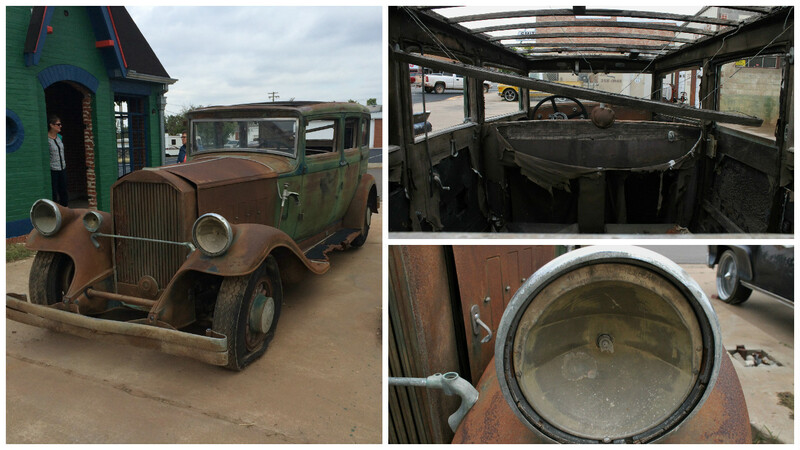 The Threatt Filling Station was a safe place for them. It was open from 1915 to the 1950's. Arcadia was established shortly after the Land Rush. 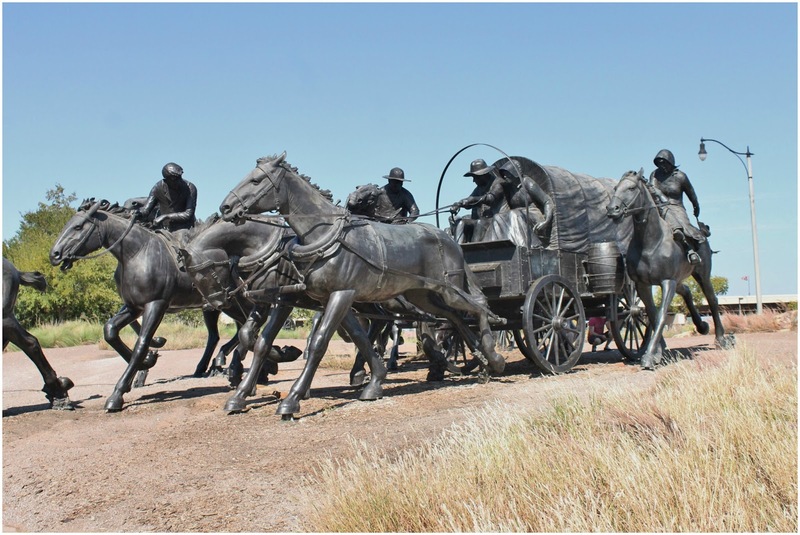 At the turn of the 20th Century the census reported that the area was split 50/50 black and white. 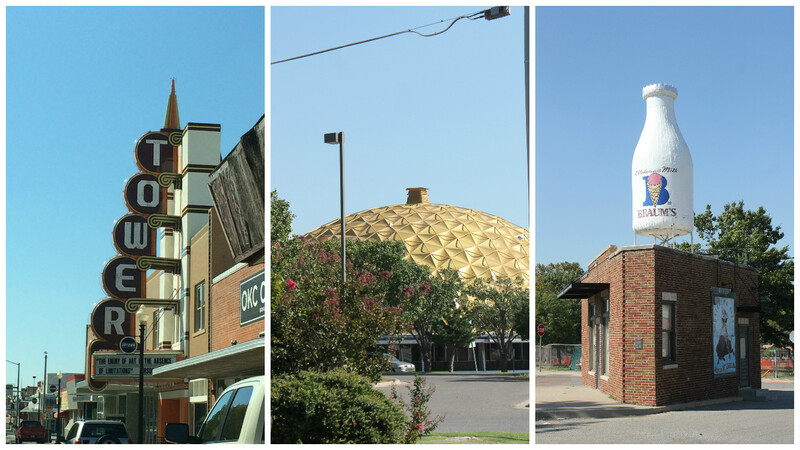 The route brought many businesses to the area. Just before you get to town are Ruins of an old gas station that had been in business for years, but the owners got themselves in trouble when they got involved with making counterfeit money. 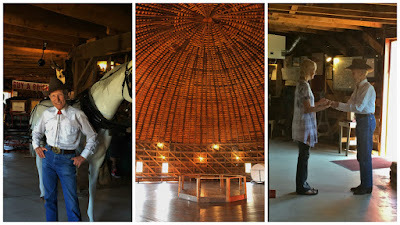 he is 89, who gives you a short tour through the memorabilia, he lives not far from the barn. 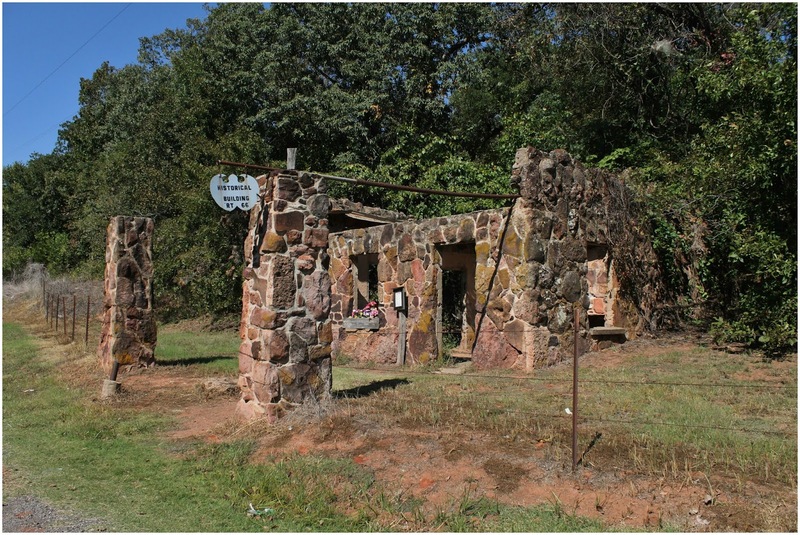 In fact the gas station ruins are next to his property. He has great stories to tell, it was so fun to listen to him. He taught one of the ladies in the group to dance. The upper level is used as an event room. 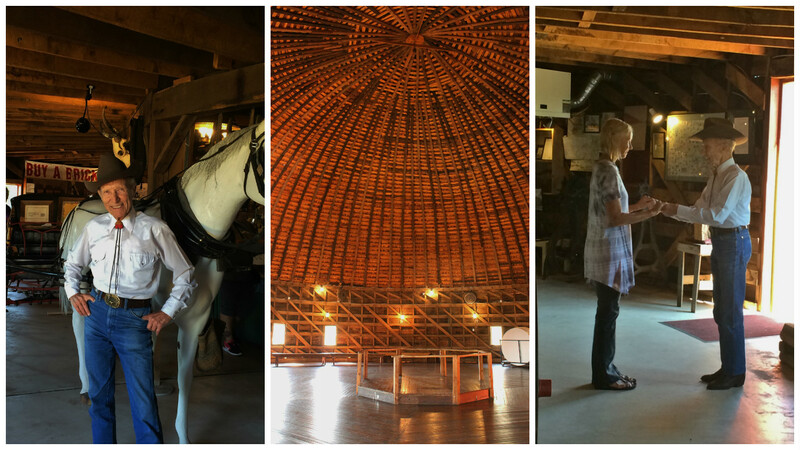 What a cool place to have a wedding. 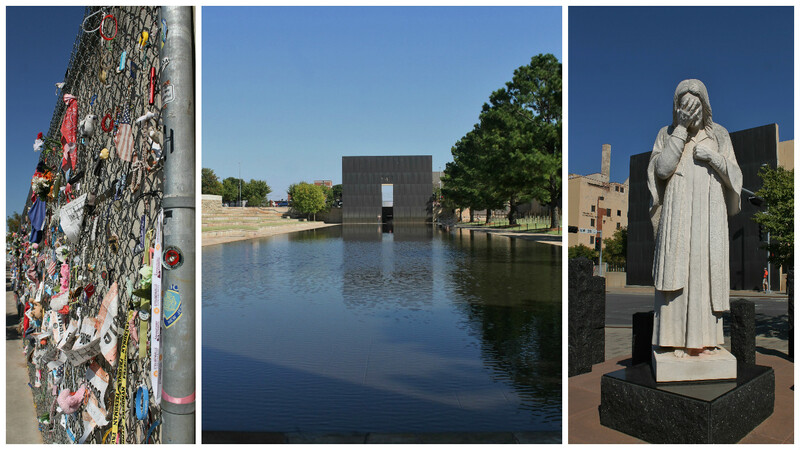 Oklahoma City didn't have as much about Route 66 as we expected. There are a lot of other great things. They have a wonderful river area. 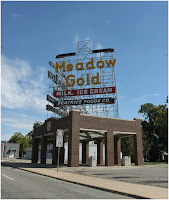 The Route 66 places we found were, The Tower Theater sign, the Gold Dome building and the Milk Bottle Building. 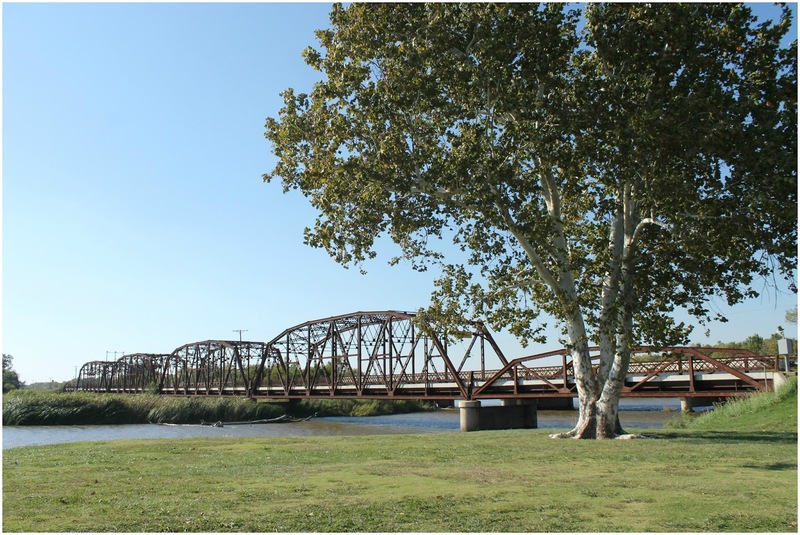 On the western edge of town is the Overhosler Bridge, built in 1925. 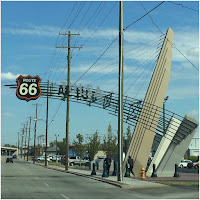 It carried Route 66 traffic until the 1950's, when traffic volume increased and a wider four-lane highway was built next to it. It still carries local traffic across the North Canadian River. 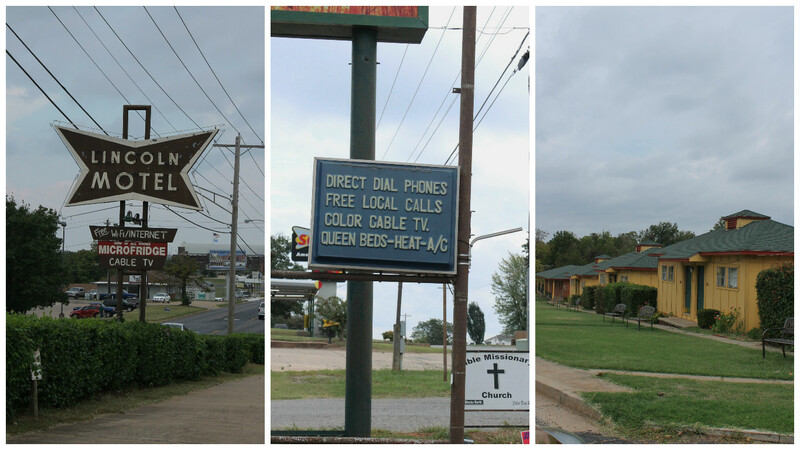 We of course found a number of Roadside Oddities on our travels. 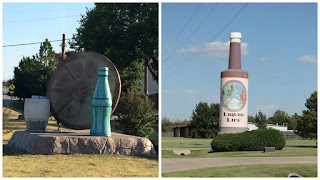 In Tulsa we found drinks, a large bottle of Liquid Life and what appears to be a Mixed Drink. Plus, a giant "Spider" Bug. 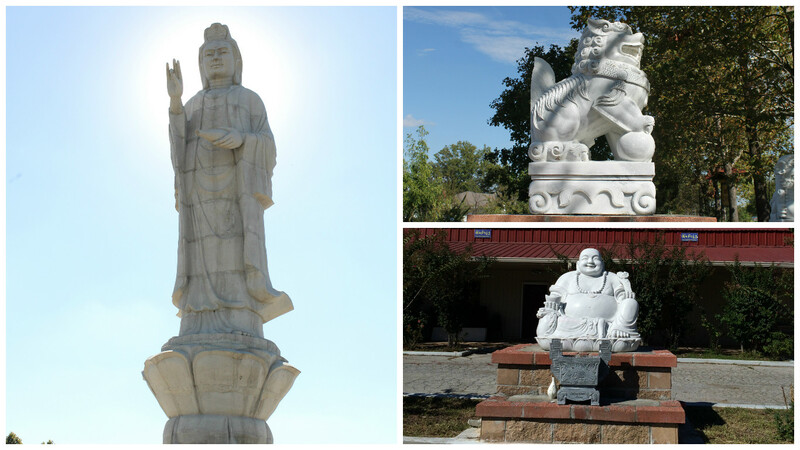 The largest Buddhist Deity , Quan Am Bodhisattva, embodiment of compassion and kindness, also lives in Tulsa. She stands 50-feet tall and is on the grounds of the Tam Bao Buddhist Temple. Steve's Service Station in Davenport, not really a roadside, but our son-in-laws name. In Arcadia we found a Large Pop Bottle outside of Pop's convenience store. It is lit up at night and changes color. 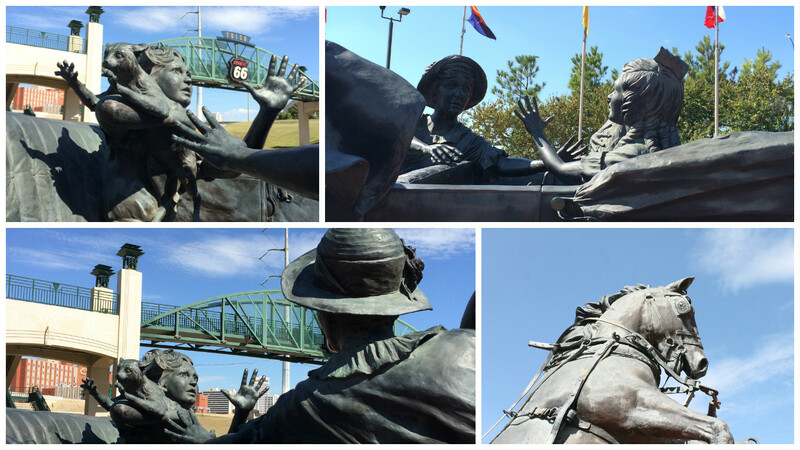 A statue of Chief Who Touches the Clouds is on the campus of the University of Central Oklahoma in Edmond. Once again the Barrett Drug Center is not really a roadside oddity but how could we pass it up? In Tulsa this crazy hanging metal piece is a circular staircase that architects hung between two buildings because they thought it looked like DNA. 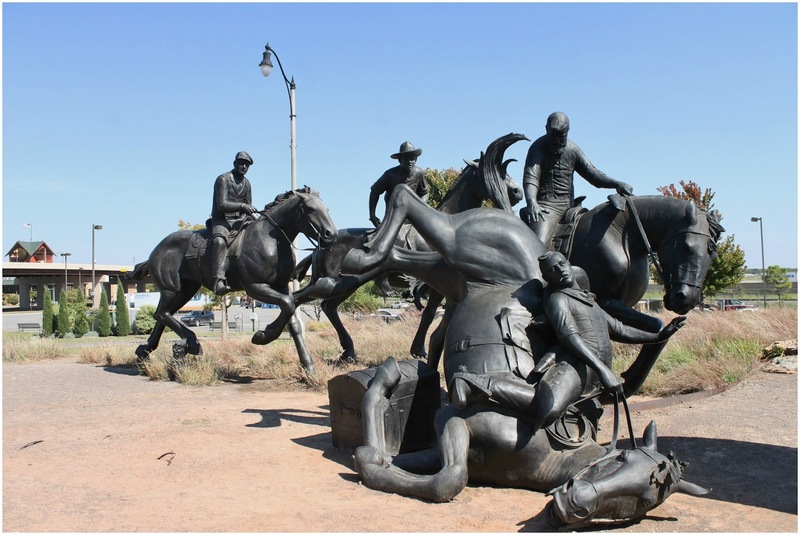 questionable, the sculptures depicting it are quite amazing. 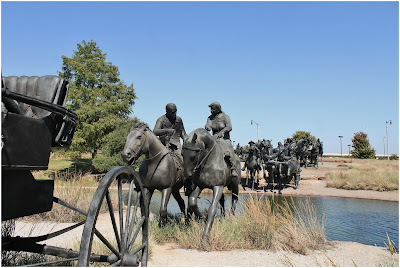 They sit in a park along the river walk and actually cross over the river. 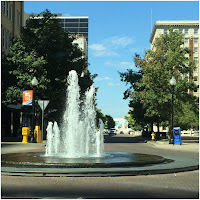 It is a beautiful area with a waterfall and walkways on both sides of the river. 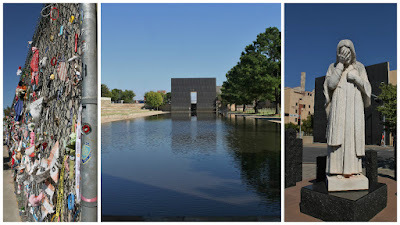 On a more somber note, we visited the memorial of the Oklahoma Bombing. The fences on either side of the doorway are lined with items people have left to pay their respects. Inside the memorial it is so peaceful, such a contrast to the atrocity that happened here. Those who visit are respectful of the space and speak in soft voices and walk slowly among the chairs. Across the street is a statue of Jesus with his head held in his hand, it seems to be the most perfect response. 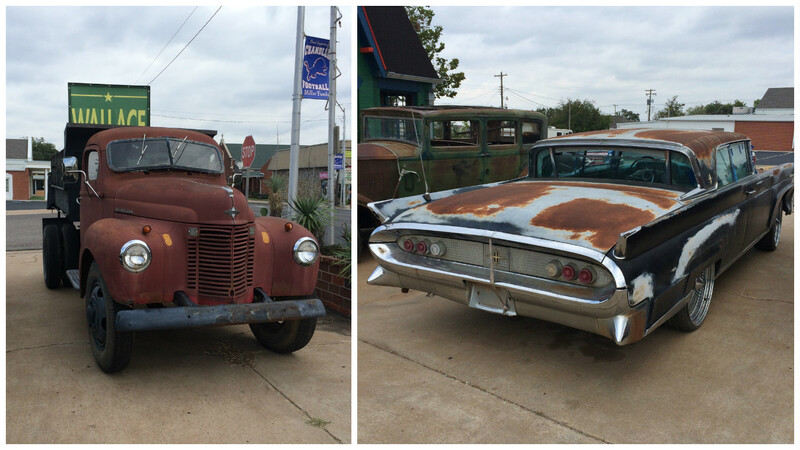 We are detouring off of Route 66 again and heading to Dallas, TX. 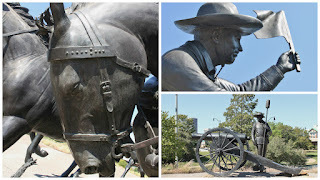 A stop at the Bush Museum, JKF Memorial and a visit with one of Les's cousins in on the agenda. ~ Flapping in the breeze. When we travel in the RV we try to keep the windows open as much as possible and not use the AC. We average about 7 miles to the gallon for gas, and using the AC makes that even worse. One issue we encountered was that the drapes that wrap around the front window flap in the breeze. They have a plastic strap that holds them together but not tight enough. Our solution is a small ribbon run through the back of the drape where it connects to the wall and tied tight. No more flapping and billowing drapes and no more noise. Your travels and pictures would make a great book. My husband was from Oklahoma. Some interesting things there, nice people....I'll have to remember to check back frequently to see your nextra stop. Such fun you guys are having. Well deserved. Hi Darlene we have talked about doing a book at some point - to busy having fun at the moment! Thanks for checking in on us and come back anytime.